The new Broomfield MP-5 Programmable Coil Winding Controller is the latest generation of a long line of rugged, real-world tested, winding machine controllers. Featuring a large, bright color display, the Broomfield MP-5 provides maximum information with an intuitive operating and programming logic. So that our existing customers will feel immediately comfortable, we continue to utilize the same well-known programming command structure to which they are accustomed. 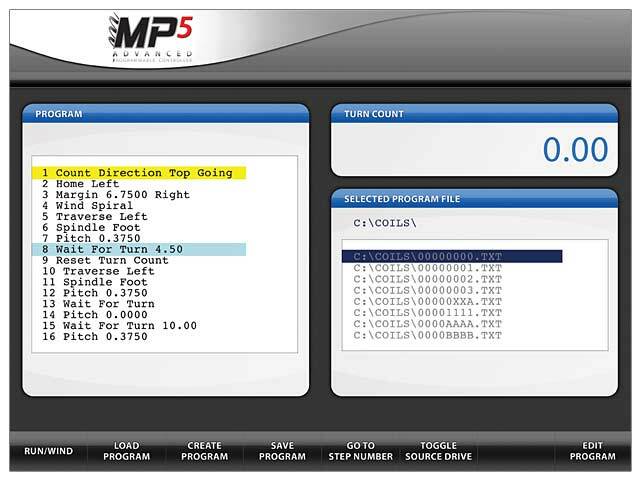 Programs written for previous Broomfield MP models will run on the new MP-5. In addition, we have added the capability to include pictures, videos, and rich text files into winding programs. This will aid in training or provide instruction during the winding of a coil. The MP-5 provides users with the distinctive "Start-From-Turns" capability. This unique feature allows a coil winding program to be started at any place within that program. If an error occurs during winding, it is possible to go back to that point, make the correction, and then resume, saving time and materials. The MP-5 features a USB port so program storage and back-up can be accomplished via familiar USB-based removable media. The controller can also connect to a network for remote program storage. A variety of display screens may be viewed while running a program. These include current turns count, layer, elapsed time since starting the program, pitch, wire guide position, spindle rpm, and others. 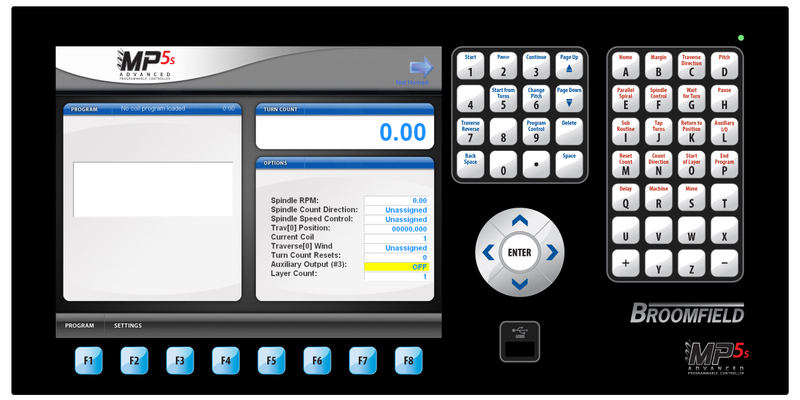 PC based control with Windows Embedded® operation system. "Start from turns" feature allows starting from mid-program. Easy machine programming/editing at the control or from a PC. 1,000 lines of programming space per coil. Hundreds of programs can be stored in the MP-5 memory. 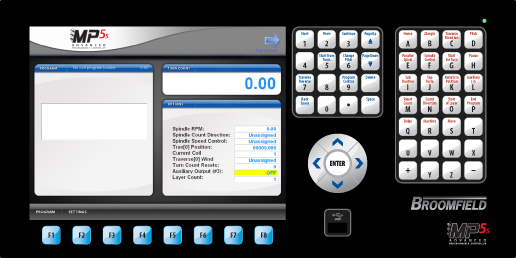 Displays video, photos and rich text files for operator information and training. Networking capabilities and USB ports for easy backup. Log files for data collection. Battery backup system ensuring no loss of turns count during power failure. Additional I/O is available to control remote devices for further automation.